Canvas @ YaleInstructor Guides AnnouncementsHow do I Create an Announcement? Announcements allow you to send messages to students in your course. You can specify the announcements by section, or send them to your entire class. 1. Click on Announcements from your course navigation. 2. Click on + Announcements. 4. Use the rich content editor to enter the contents of you announcement. 5. 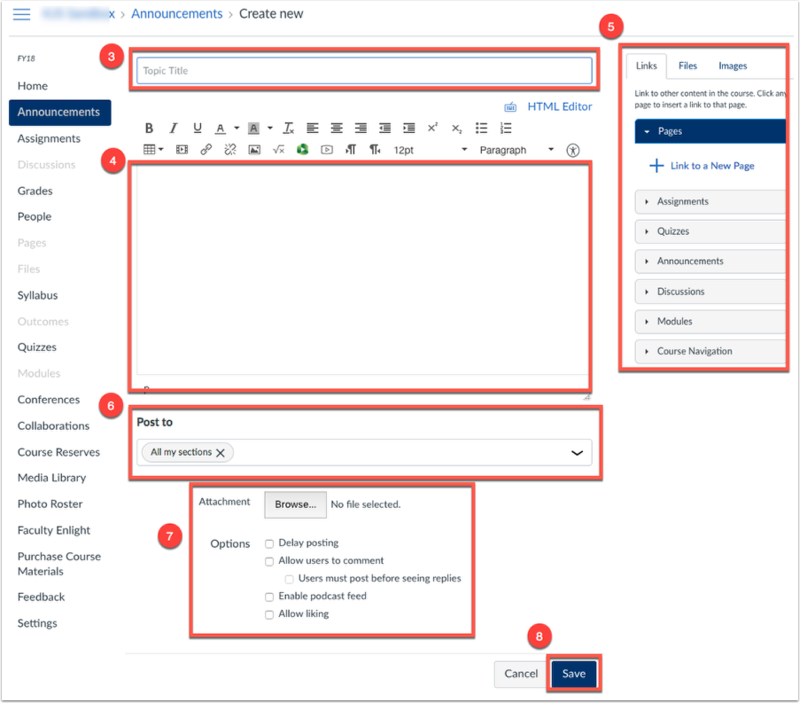 To link to Canvas content within your site, use the content selector panel to choose which items in your Canvas site you would like to include in your announcement. 6. Choose the section where you would like to send your announcement. By default, your announcement will be sent to all sections. To specify the section, simply begin typing and the various sections in the course will populate. 7. You have various options for sending you announcement. Choose the appropriate options for your announcement. 8. Click Save, and your announcement will be sent. Prev: How do I Communicate with my students?